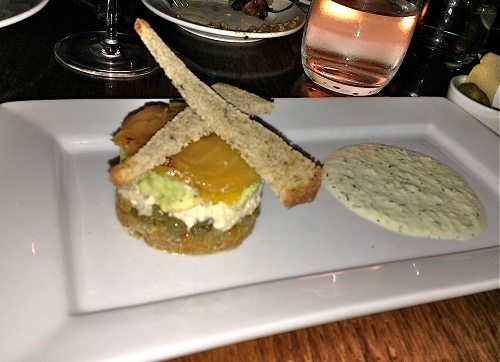 We had a top notch dining experience at Vedge, a wonderful vegan restaurant in Philadelphia. It's ranked as one of the best restaurants in the city, and it focuses on local seasonal vegetables. I first got excited about Vedge in Philadelphia long before it even opened, and about 20 seconds after hearing the devastating news that Horizons was closing. I'd only been to Horizons once and it was an out-of-this-world vegan culinary experience. Horizons was known across the country as a top notch vegetarian restaurant for years, so I think a good number of people were shocked to hear it was no more. 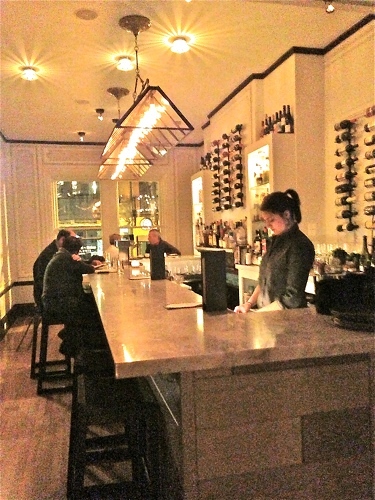 But Chef/Owners Richard Landau and Kate Jacoby had a new plan in place to give us a new dining experience focused on local, seasonal vegetables with the same amazing collection of flavors and gorgeous presentation as in their first restaurant. 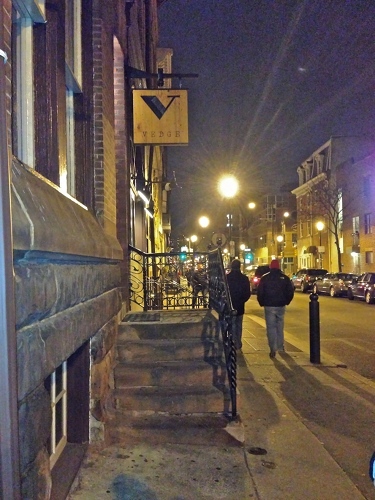 Vedge opened in Washington Square West in Philly in the fall of 2011 and by 2012 had earned the honors of #3 in Philadelphia Magazine's 50 Best Restaurants of 2012 of #9 in Zagat's 2013 Restaurant Surveys list, and a host of other honors and excellent reviews. Although it's a completely vegan restaurant, there are very few mock meats, which makes it very friendly for anyone who loves good food and can have one nice meal that includes no meat. 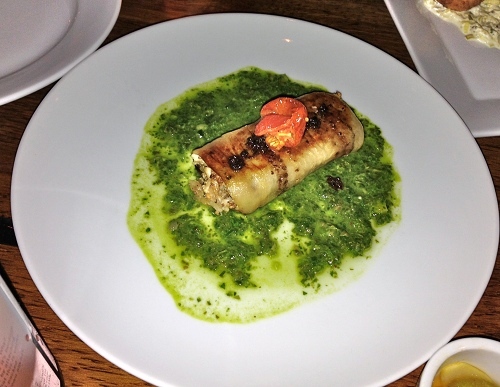 Of my party of 6, only my husband and I was vegan, and everyone seemed to truly love the food and overall experience of eating at Vedge. Vedge uses a small plate philosophy, which allows you to sample quite a few of their dishes and come away with an expanded idea of all the beautiful things that can be done with vegetables. Our server recommended we aim for 3-4 dishes per person, but I think each couple had either five or six dishes and we were all completely full when we left. In addition to the main menu, there's also a daily "dirt list" featuring foods from local farms. I think this is a great restaurant for any foodie, as many of the dishes mimicked cooking or serving styles of more well-known foods like carpaccio, pates, crepes, and everything was plated with complementary foods and sauces. There's an international flair to their dishes, which the chefs say comes from their love of travel and learning the food of new cultures. The decor is elegant but modern, and though the tables are widely spread apart, there's a cozy feeling in the restaurant. The dining area is split into several rooms, which gives you the feel of eating at a friend's house rather than one massive dining hall. We sat in a room with a fireplace tucked between the two bars and square in the middle of the restaurant. Only one of my friends had a Vedge cocktail, but she loved it. The bartenders use homemade syrups and bitters to create interesting drinks. All the beers and wines come from small craft and boutique companies. Want to see what we had? We started with the "full board" appetizer for the table. 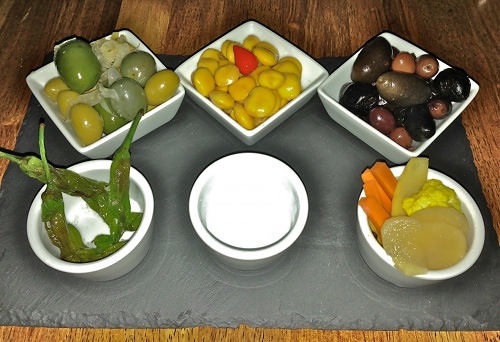 It had a nice selection of green and black olives, roasted peppers, homemade pickles, and lupini beans. Our server suggested we pop the shells off the beans and just eat the inside but I had absolutely no problem eating the entire thing. It was a nice tasty, savory way to start the meal. We loved the salt roasted golden beet dish, and it appealed specifically to my husband who grew up on smoked salmon and lox. The beets were sliced uber thin and placed atop avocado, smoked tofu, and capers and dressed with a creamy cucumber dill sauce and a few slices of rye bread. The beets were perfectly cooked and melt-in-your-mouth delicious. 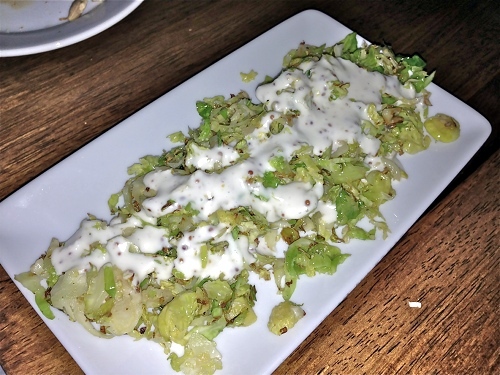 A big hit at the table were the Brussels Sprouts from the dirt list, which the chefs shaved and grilled and then topped with smoked mustard. The mustard sauce was super creamy and light and prompted a lot of questions like, "how do they make it so creamy without milk?" Believe me, if I knew my husband would love me that much more. Both omnivore couples also had the autumn squash pierogies with chanterelles, madeira, and hazelnut picada, and it was the favorite of my most dedicated meat-eating friend. Even though up front he said he doesn't really like mushrooms, who can resist a perfectly cooked chanterelle in wine sauce? I thought the bite of crunchy hazelnut was the perfect topping for the classic pierogies. I remembered an eggplant braciole from Horizons that we absolutely adored, so I recommended it to my friends, and while they liked it, they said they preferred the pierogies. I didn't taste it and don't know if it was filled the same way as the Horizons version, so I can't vouch for its flavor. It was prepared in the same style, smoked and very thinly sliced and then wrapped around cauliflower, salsa verde, and cured olives. 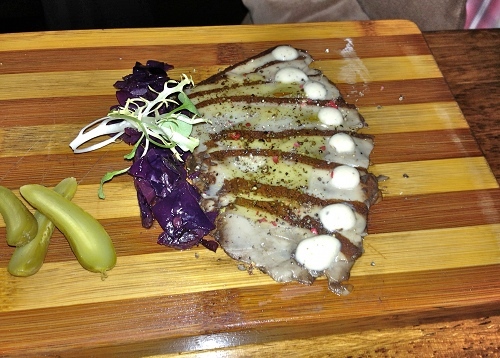 Our table also tried the portabella carpaccio sliced thinly and presented on a wood plate. 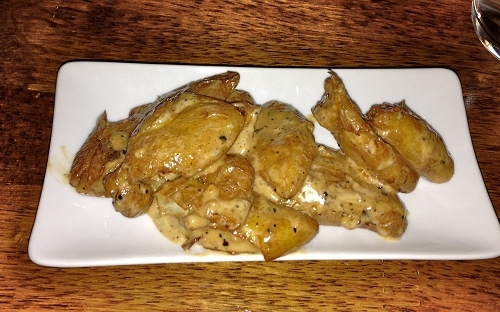 They added pickled cabbage, cornichons, and a creamy horseradish sauce for a light and flavorful smaller dish. 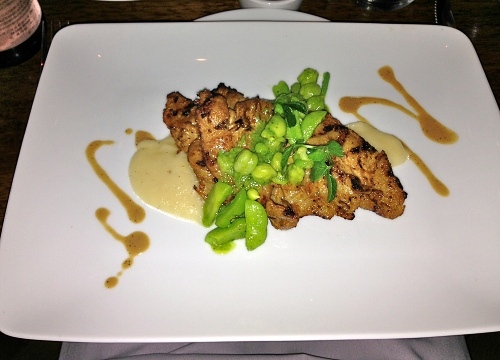 A few of us tried the grilled seitan, which with its accompaniments of English peas and mashed parsnips was a nod to a classic meat and potatoes American dish. They even dressed it with a truffle steak sauce. 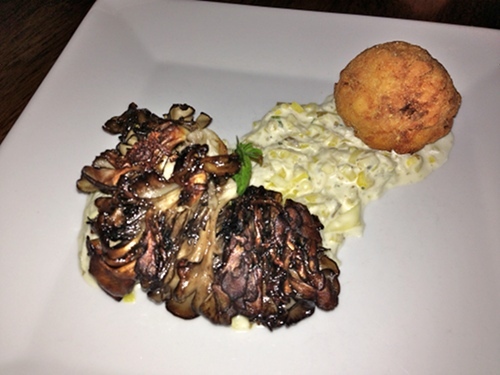 I liked that Vedge used large pieces of maitake mushrooms, and I enjoyed the celery root fritter and smoky remoulade that came with it, but the overall flavor wasn't as stimulating as some of our other dishes. The only dish I wasn't blown away by was the wood grilled sweet potato pate, but I think that was more of a personal preference thing than any problem with the dish itself. It was plated with a grainy mustard and jerk cashews and a few pieces of toast. 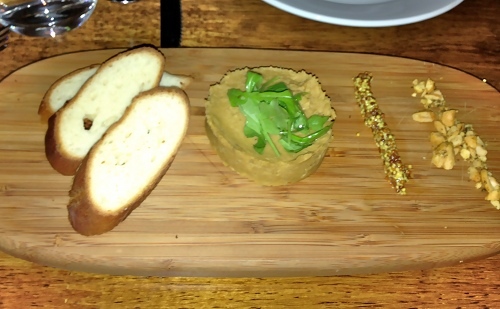 With so much pate, we could have used a few more slices of toast to divvy up the pate properly. We were pretty much satiated after that dinner, but I had read about Vedge's sticky toffee pudding, so I knew we would have to try it for dessert. What's funny is that while many of the entrees are smaller portions, the desserts seem to be just about regular size in comparison to other fine dining desserts. Even if I had known this ahead of time, I still would have opted for the pudding as well as splitting another dessert with the table, just to try it. The sticky toffee pudding was very tasty, and a perfect fall or winter dish. They included a cinnamon stick for decoration and it was covered with pumpkin ice cream that I thought was delicious. 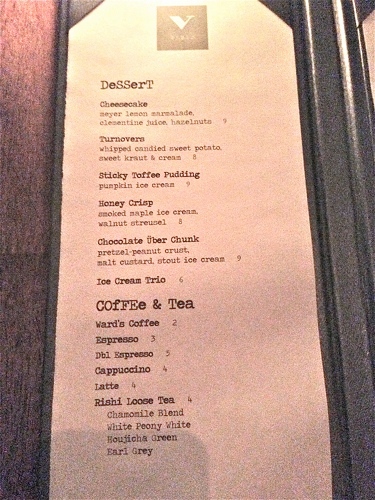 As for our other dessert, they had me at "meyer lemon." 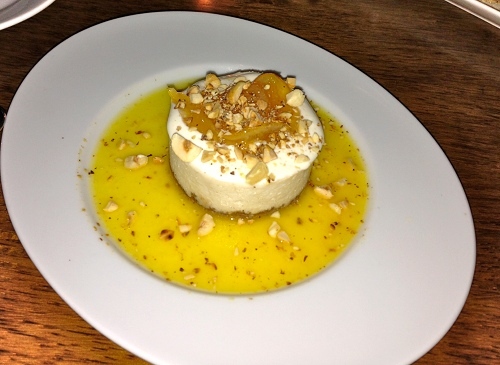 I don't gravitate towards cheesecakes, but I love any fruity or citrusy dessert, so this one with meyer lemon marmalade, clementine juice, and hazelnuts was a perfect combo for me. It was insanely good. 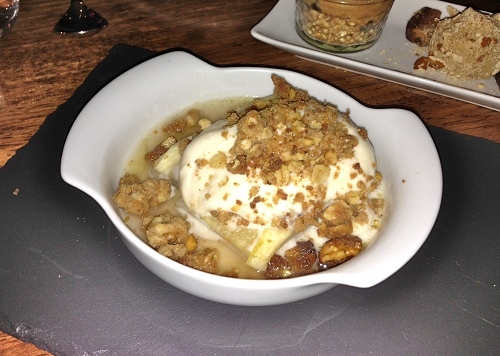 I didn't try the Honey Crisp dessert, but with maple ice cream and walnut streusel, it looks like a winner. Between the six of us, we tried quite a bit of their menu, and nothing disappointed. When we tried to answer the question of what we liked best, most of us listed at least two dishes. So, what did I like best? I'd have to go with an item off their daily dirt list, mushroom cioppino. My husband would probably pick the roasted beets entree that presented like lox with a dill sauce, but he also loved the roasted rutabaga salad. My other friends would have probably said the saffron cauliflower soup, the squash pierogies, and the fingerling potato fries were their favorites. 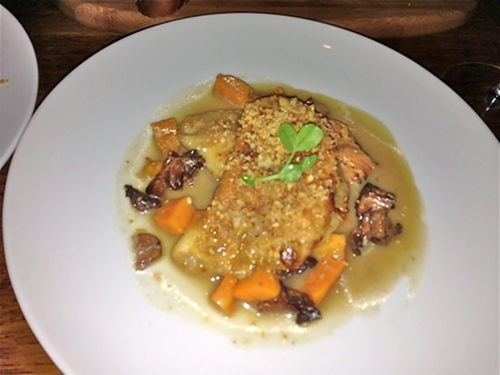 The autumn squash pierogies with hazelnut picata, chanterelles, and madeira sauce. I think they may have smashed the fingerlings first and then fried them because they just didn't have the classic oblong shape I'm used to. Regardless of how they looked, they tasted great. I loved that the Worcestershire sauce was creamy and only slightly pungent. 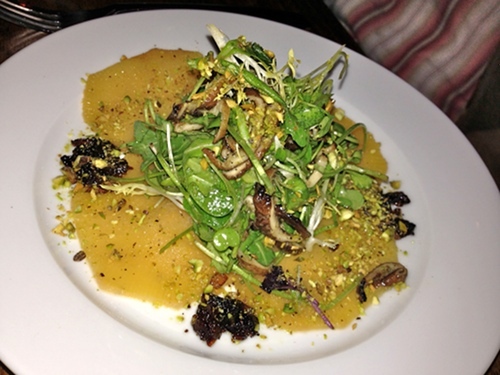 Vedge's roasted rutabage salad with arugula and shiitake mushrooms, charred onions, and pistachios. I think Vedge is the perfect restaurant for anyone with a good love of fresh food who can veer away from meat and dairy for one meal. It's an amazing example of what can be done with seasonal vegetables and a real understanding of the culinary arts.